Please copy and paste ' [[Category:Chromis]] ' into the end of your article to include it in this category. 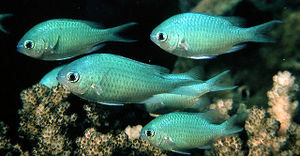 Damselfish of the genus 'Chromis' are known for being generally a peaceful fish for a reef set up. However, they will form a hierarchy eventually, and it is recommended to keep at least six in a group to avoid the weakest being picked on. The tank should be spacious for them or they will constantly spar. 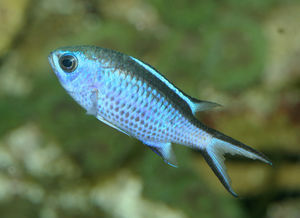 Also, they should not be housed with aggressive species as they will harass the Chromis. This page was last edited on 4 January 2018, at 20:37.